Suggested Use: Take one (1) softgel daily, preferably with a meal. Other Ingredients: Bovine Gelatin, Glycerin, Water, Ethyl Vanillin. Caution: If you are pregnant or nursing, allergic to shellfish, taking medications, facing surgery, have bleeding problems or undergoing any other treatment that may affect the ability of blood to clot, consult your physician before taking this product. Omega-3 fatty acids are necessary for maintaining optimum health, but the body cannot produce them. Since the typical North American diet is deficient in omega-3 fatty acids, supplements provide the simplest, most consistent source of these essential fatty acids. Phospholipids are a class of waxy, oily fats, that are the essential building blocks of all cell membranes — and they have a simpler digestive process than other forms of fatty acids. Kirkland Signature Krill Oil softgels are small—ideal for those who find regular fish oil capsules difficult to swallow—and leave no fishy aftertaste. 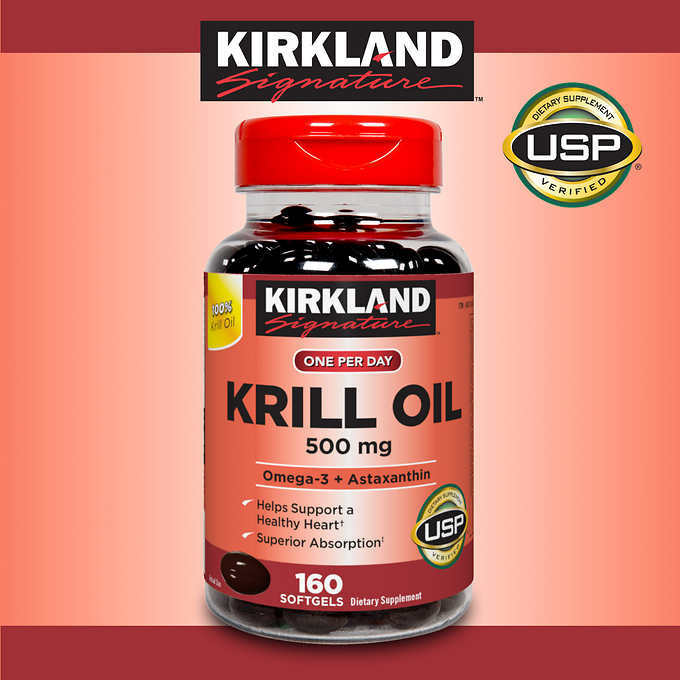 Kirkland Signature Krill Oil is guaranteed to contain consistently fresh, stable, high quality oil that is harvested in a sustainable manner. The krill oil used is independently certified by Friend of the Sea for being harvested in a manner designed to protect the Antarctic eco-system. The precise krill-catching methodology used to manufacture Kirkland Signature Krill Oil uses an acoustic search technology that ensures only krill swarms of a suitable size are harvested. The processing method does not require large quantities of krill and is not dependent on a continuous pumping system to bring the krill on board. In addition, bottom trawling is not used in the harvesting for Kirkland Signature Krill Oil, as zero by-catch is allowed. This helps prevent any harm to the seabed and preserves the area for natural predators.